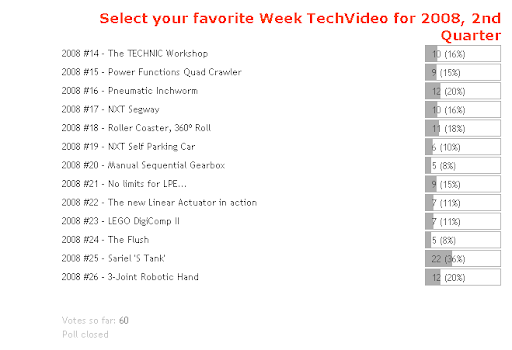 TBs poll for '2008, 2nd Quarter Favorite week TechVideos' have finished, after a bit more than one week and 60 votes. Here it goes the results. Poll objective was to let you choose your favorite videos, from those weekly presented here during 2008 2nd quarter, at section 'Week TechVideo'. So it seems the favorite this time was the 'S Tank' from Sariel with significative advance from the remaining. #1 - "Week TechVideo, 2008 #25 - Sariel 'S Tank'"
#2 - This quarter we got two videos ex aequo for the 2nd position: "Week TechVideo, 2008 #16 - Pneumatic Inchworm" and "Week TechVideo, 2008 #26 - 3-Joint Robotic Hand"
#3 - "Week TechVideo, 2008 #18 - Roller Coaster, 360º Roll"
Thanks for all who voted, congratulations for all the contestants.